We recently took part in a STEM (Science, Technology, Engineering and Maths) afternoon. We did lots of experiments, including testing vegetable juices and looking at its colours, building a lego city, looking at magnets using magnetix, testing electrical circuits with an on and off switch, building a Jenga tower, making animals from polystyrene and using robots to sense a dark line. We loved it and thought it was fun, cool and educational! By Ben and Erin. In Geography we have been learning about volcanoes. We produced a drama about the stages of their formation. In History this term we have been learning about the STone Age. We made some pots from clay similar to pots Stone Age people would hve used. We have been enjoying learning about Samba music with Mr. Fox and this week we did a performance for everyone in assembly. It was loud, but we loved it and we think the parents and teachers did too! We have been using Venn diagrams to work out multiples of 5's and 2's.Then we used this skill to sort our rocks and crystals in Science. This was a fun way to do our Science lesson and maths. By Emily and Fred. Here is our Topic Web for Spring term. Non-uniform 'Spotty' day, with or without made hair, in return for £1 donation to Children in Need. Coffee morning 9am - 10am, to include raffle and 'bring and buy' sale. Please donate up to 3 items for the Bring and Buy Sale all this week (Monday 12th November to Thursday 15th November) e.g. books, clothes, toys, dressing up clothes (all in good, clean, working order please). 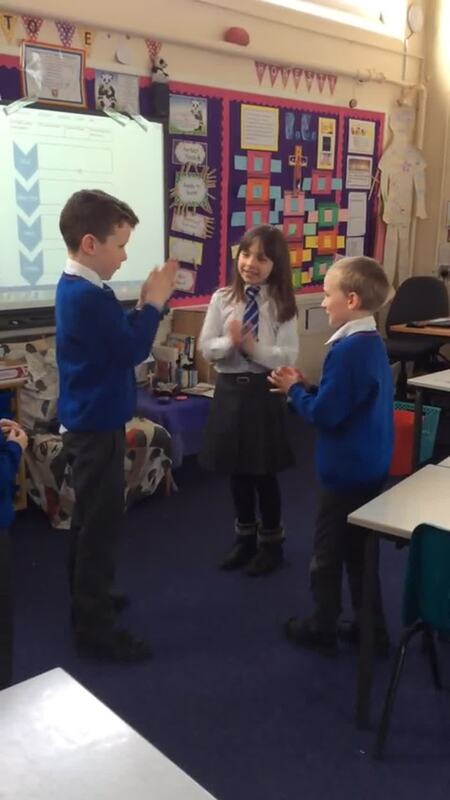 We have been acting out some scenes from our class story Stone Age Boy and practising using prepositions to describe exactly where a noun is! A fun way to learn. Welcome to our class webpage. Here you will find: helpful information about our class; photos of what we have been doing; our current homework and spellings list and much more! Please feel free to contact Mrs Dugdale if you have any questions. Mrs Dugdale is the class teacher, supported by Mrs Fox in the mornings. We also have Mrs Stones who teaches PE and RE on a Tuesday Morning. We are also joined by Mrs Sawyer on a Tuesday afternoon as well as other helpful volunteers throughout the week. Lessons start at 8:55am so please be on time. Children are welcome in class at 8:45am for a morning activity. At the end of the day, children should be collected from the Infant Playground. Our P.E. days are currently Tuesday and Wednesday. Children are to wear pumps, a white t-shirt, blue shorts and socks. No jewellery is to be worn and plasters must be brought to cover ear-rings. Hair should be tied back with a blue or black bobble. Reading - please read with your child every evening and sign their yellow reading record. Bug Club - your children are allocated books on 'Bug Club' to read online. Please make use of this fabulous resource and let us know if you any problems. Friday homework will include spellings (tested on the following Friday) as well as a Maths or English task to complete. Please hand homework in on Wednesdays. |This year we have used some recycled bottle tops to make our tree decorations. Some were snowmen and some Christmas trees.We enjoyed hanging them on our school tree. 28.11.2018 This week in English we have been looking at time conjunctions, we used a fly swot to see who could identify the correct one. 26/11/2018: This week we had the opportunity to learn to play Tchoukball, provided by Premier Sport. It involved throwing a ball on to bouncy net. It was great fun! 21/9/2018: We have been looking at shapes and their properties this last week in class. 26/9/2018: We were delighted to welcome the Blue Moose Dance Company into Year 3. We learnt how to do a highland dance as well as the flamenco! Olé! 28/9/2018: Shh! We are busy writing our fables! 3/10/2018: A snapshot in time... Here we are learning that similes and adjectives really go a long way to improving our poetry. 5/10/2018: Have a look at a selection of our shape poems. They look scrumptious!